Sorry, we are currently sold out of 'Breathtaking Millefori Flower Button Beads'. Please check back later. 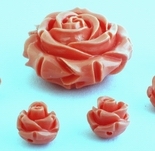 Sorry, we are currently sold out of '6 Beautiful Carved Carnelain Flower Beads'. Please check back later. Sorry, we are currently sold out of 'Seductive Rosaline Pink Flower Lampwork Beads'. Please check back later. Sorry, we are currently sold out of 'Beautiful Millefiori Blue Tube Flower Beads'. Please check back later.